Juaquin Malphurs, (born July 1986) better known by his stage name Waka Flocka Flame, is an American rapper signed to So Icey Entertainment. He is the son of Debra Antney, Gucci Mane's former manager and CEO of So Icey/Mizay Entertainment. Malphurs moved with his family from Jamaica, Queens, New York to Riverdale, Georgia when he was nine years old. The name "Waka" was given to him by family members. The name "Flocka Flame" was given to him by rapper Gucci Mane.Waka Flocka is a member of the 1017 Brick Squad Boyz, with Gucci Mane, OJ Da Juiceman, Frenchie, and Wooh Da Kid. Juaquin Malphurs, (born July 1986) better known by his stage name Waka Flocka Flame, is an American rapper signed to So Icey Entertainment. He is the son of Debra Antney, Gucci Mane's former manager and CEO of So Icey/Mizay Entertainment. Malphurs moved with his family from Jamaica, Queens, New York to Riverdale, Georgia when he was nine years old. The name "Waka" was given to him by family members. The name "Flocka Flame" was given to him by rapper Gucci Mane.Waka Flocka is a member of the 1017 Brick Squad Boyz, with Gucci Mane, OJ Da Juiceman, Frenchie, and Wooh Da Kid. He was shot in the arm while struggling with a robber at a car wash in Atlanta, Georgia on the morning of January 19, 2010. His debut single is called "O Let's Do It",which peaked at #62 on the Billboard Hot 100. His upcoming debut album, Flockavelli was released later on in 2010. The Round Of Applause Songfacts says. After an early version of "Round of Applause without Drake leaked in early August 2011, it was remixed by the Toronto MC and released it through his official blog October's Very Own, on September 11, 2011. Waka Flocka Flame then chose to master the remix and release it as the official single from his second album, Triple F Life: Friends, Fans and Family. It was released to iTunes on October 18, 2011, and to U.S. urban radio on November 1, 2011. 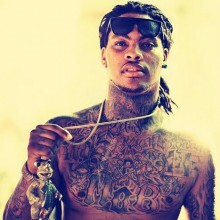 Darling fans if you are reading this, you clicked on the page of the recording artist waka flocka in our eLyricsWorld. Our database has data about 52389 artists from all over the world as well as 829824 songs 29 of which are from waka flocka. Besides the artist's biography, on this page you can see brief information about them, enlists birthdate, style, record label Be conversant with all the events around waka flocka by adding RSS feed. If you prefer you could directly visit the page you are on right now and check out the latest songs about the artist.